The certificate in Principles of Occupational Safety and Health is an intensive four-day course covering 19 topics that provide a solid understanding of fundamentals of workplace safety and health. 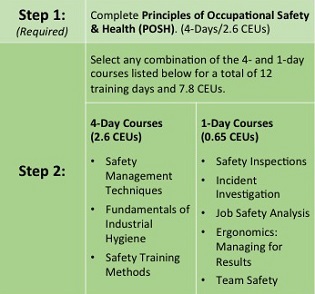 The course focuses on best practices for implementing and managing a safety program. POSH is a great introduction for anyone new to safety responsibilities and an excellent review for experienced safety practitioners. Completion of POSH qualifies you to pursue the NSC Advanced Safety Certificate, a nationally recognized safety program that sharpens your safety and leadership skills so you can drive fundamental safety change throughout your organization. For individuals on a career path in safety, this program provides a clear roadmap and best-in-class education to meet many industry-leading certification requirements. Learn More. Register today and get the confidence you need to implement a comprehensive safety process in your organization.